'Shoot me a quick email again and I will get all this off to you. (Sheri sent this to you about a week ago)"
Can you confirm that you have all the PDF's. Title, Bill of sale, Import App, the chocalate bar, newspaper, rubber gloves, thermal socks, chewing gum, stubbie holder and the bear claw? I havent had a chance to do proper pics. Been working on her throughout the week getting her ready. Its great learning about a completely different car. I will get some photos up this weekend and post them (and let the cat out). Have you jumped ship Thirsty? (not that there's anything wrong with that). OK..... I will get some proper pics up this weekend. So I take it that, when the women in your life celebrate a birthday, you are given permission to buy them an expensive new toy! 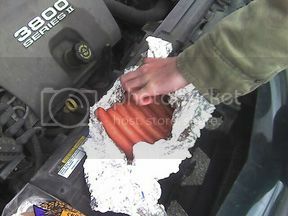 Just keep reminding yourelf, with a bit of aluminium foil you can cook a meal in your engine bay but you can't drive around in your kitchen. Why not start a thread to see what people guess it to be first before the release? My guesses are Camaro, Chevelle or CORVETTE. The Aussie broker bill sounds high, what's the breakdown there? That's including Customs GST right? The rest sounds similar, trucking from Florida to L.A. is a long haul, not sure if another port may have been a better option but the savings would be only in the trucking. Yep sounds about right . Now it depends on how it was shipped ,in a container or drive on drive off .The way i look at it would be this way ,14500 for car ,1300 trucking to la ,around 2000 gst ,frieght to aust in container 3100 ,insurance in your case 600 .total around 21500 plus cleaning and extras and in your case shermatt 2 000 . so 23600 .Now thats how i would and have been expecting ,cheaper if drive on/off take off 1500 . Plus truck home 100 dollars . Agree, sounds right to me. The Aussie end would include GST Stephen. I looked up a number of passed threads on costs in bringing cars in before I bought mine. I remember a couple posts saying allow between 7-10K , depending on how far port to Long Beach US shipping was, what port it was going to in Aus and of the GST on your purchase price. On top of all these was the car cost, Shermatt fee, Shermatt inspection costs, internal US freight, Sea Container ocean Freight, import approval and insurance!